The Bugle rock formation in Basavanagudi is a nice place to be and to relax. Almost 3,000 million years old, this rock formation has a park around it as well. One of the oldest rock formations in the world, Bugle Rock gets its name from an age old practice of a sentry holding a torch and blowing a bugle to alert people of an intruder or to tell everyone that the area is safe. The rock formation is very similar to the one at Lalbagh and is spread over an area of 16 acres. Most of the rocks here are hollow, used as lamps (yes, a 3 billion-year-old lamp, sounds really cool). One of the four watch towers in Bangalore was built here by Kempe Gowda I. The watch tower was where the sentry would blow the bugle and it was said that the torch light would be visible from the other watch towers in the city. 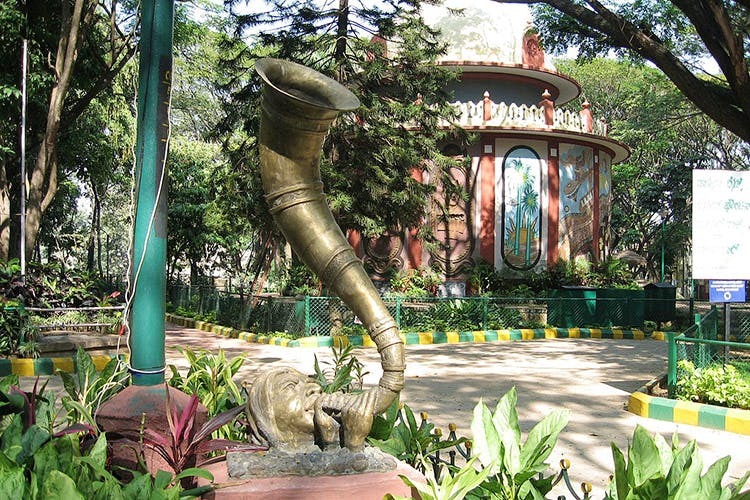 Bugle Rock Park is one of Bangalore's Green Lungs, with the lush flora (and also waterfalls). With three temples and walking and jogging track (and an open gym if you're looking for a workout) in the park, amidst the greenery, the area is frequented by locals every day. Check out some statues of famous Bangaloreans, like Kempe Gowda the first, famous litterateur DV Gundappa and more. There’s even an amphitheatre here that has a capacity of 300 people, used for cultural, social and awareness events. Adjacent to the park is the bull temple or Dodda Basavana Guddi, which houses one of the largest idols of Nandi in the world. Opposite the park is Kamat Bugle Rock, famous for their North Karnataka style meals on banana leaves, in case you've worked up an appetite after you've explored the park.